Only better than Ancient Watcher if you have some spell damage synergies, otherwise quite underwhelming statline for 3 mana can't attack minion. If handlock becomes a thing, we might run it (obviously with Sunfury Protector). This is ancient watcher with +1 cost, attack, and health, and a downside that's not as bad. Seems like it might see play in silence priest, or tempo mage. You can follow this up with the arcane anomaly the next turn, which is a good start to a curve. Not as good as Humongous Razorleaf, but then again, Priest just got Unsleeping Soul, and sadly the two can't be together in Standard. So, I guess this will have to do. Not sure if Silence Priest is really a deck for Standard again, but this looks promising. I will certainly give it a try. Odd Shaman, boys! Let's go! We will have to see if spell power or silence is plentiful enough to make this neutral mechanic see play. This on turn 3 with the new Priest spell on turn 4 is 1 nice combo for 2 5/6 minions. This will be broken in silence priest or spell damage heavy decks. Y'all remember Spirit Claws? Spell Damage +1 isn't as hard to activate as people think. EDIT: I'm still curious to try this in a deck that utilizes spell damage. Yeah Odd Token Shaman just got a lot stronger! Silence priest is obvious since we saw it on stream.. what about handlock? there seem to be some spell damage support in general with around 3 spell damage cards this expansion and one more card that refers to this. maybe spell damage hunter? In mage is much more easier to always have a spell damage minion to use this card than I expected, I use the 2 manas 3/2 draw a card in the deck too. 2 manas 0/6, 2 manas 2/3 spell damage +2 if damaged, Thalnos, 4/3 elemental, 4 manas 3/3 spell damage +3. Only use very cheap damage spells for never behind on tempo and works, so far 7 wins and 3 loses. I've built a spell-damage Rogue deck around the new synergies and it feels pretty decent to play. Above all Mana Reservoir is a great spell damage card with staying power, which makes Arcane Watcher and Spellbook Binder all the more viable. 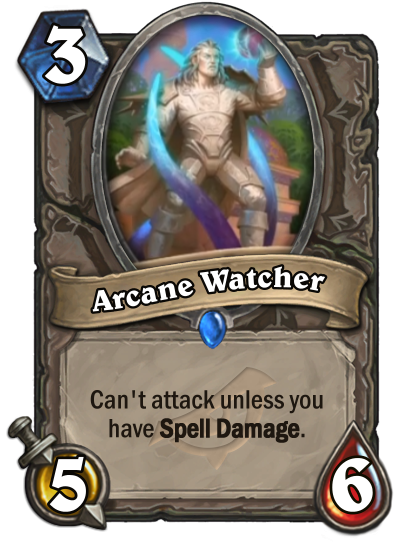 Because even if you don't have spell damage minions on the board they have to deal with Arcane Watcher because you could play a spell damage minion at any time.